Earlier this winter I posted the first in a series of flyers, 10 Ways to Explore a Book, designed to help families explore a book together. The idea behind the poster was to encourage families to enjoy books in different ways and even to extend the experience beyond the book, bringing in their own knowledge and fostering the early literacy practices of reading, writing, singing, playing and talking. 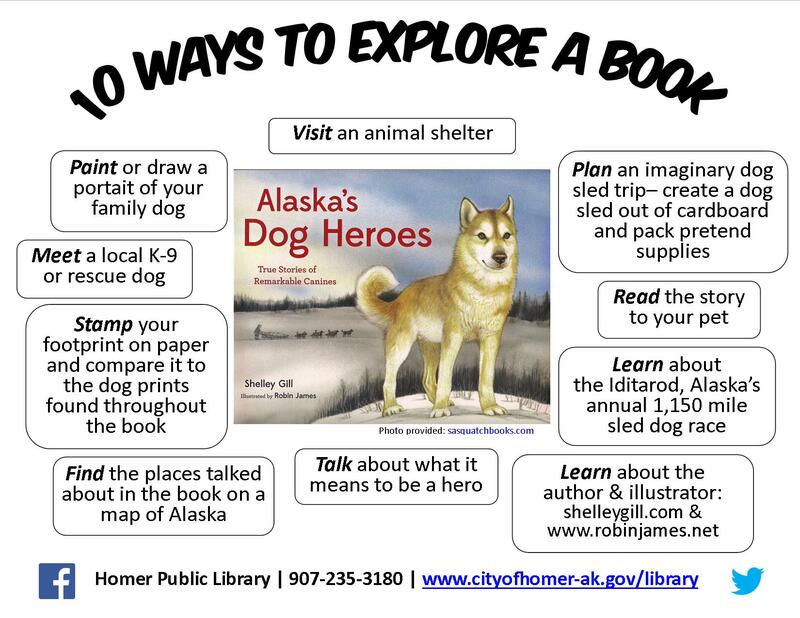 Here is the second poster in the series which features the book Alaska’s Dog Heroes (Sasquatch Books, 2014) by Shelley Gill. The book highlights the stories of several Alaskan dogs that lived a remarkable life. It’s just in time to celebrate the start of Alaska’s Iditarod, the annual 1,000 mile sled dog race between Anchorage and Nome that was established by Dorothy Page and Joe Redington, Sr. “to save the sled dog culture and Alaskan huskies, which were being phased out of existence due to the introduction of snowmobiles in Alaska; and to preserve the historical Iditarod Trail between Seward and Nome.” (Iditarod.com) You may also find the idea behind the poster useful if you’re library will be participating in the 2015 CSLP summer reading program, Every Hero Has a Story. I used your wonderful idea to create a display in our large storytime room. We have huge groups for our storytimes so this display gets lots of attention. Since we are in Seattle and it was January.. I used the book new book Raindrop Roll by April Pulley Sayre. Thanks for sharing your explore a book! I’m so glad the idea was helpful!